I’ve included a web address to an art gallery with loads of rooster art pictures. Just click on the address and it’ll take you directly to the page. I made a Power Point of some of these pictures and put them up on a screen. We discussed how artists, using the same subject (roosters), differed in their perceptions. One thing all had in common was that you knew they were painting chickens. I gave a very basic lesson in drawing a rooster, and then the 6th Graders drew their own interpretations on colored construction paper. They added borders and colored with either oil pastels, colored chalk or crayons. More info on this project, “Roosters,” can be found in the 6th Grade Projects Gallery and in the sidebar. 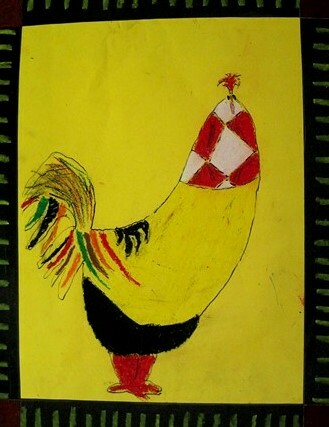 This entry was posted in 6th Grade and tagged 6th grade, art projects for kids, childrens art projects, oil pastel art projects for kids, oil pastels, rooster art, roosters. Bookmark the permalink.